In Ayurveda, we use the word Vikruti to acknowledge your current health condition, which may be affected by seasonal changes, a visit or move to a new geographical location, or the shift from one phase of life to another. Even though your original “yogic DNA” (called Prakriti) will never change, the changes you notice from external circumstances can make you feel like a different person, for better or worse. Vikruti is a way to more accurately describe your constitution based on what’s happening from moment to moment. It can help you see what health concerns may be on the rise and where your dosha and the elements may be out of alignment. As many of you know, the ancient yogis taught and believed that you are one with Nature, and that in order for you to evolve and stay healthy, you need diversity. Nature is always changing, and since we are one with nature, we too are in a constant state of renewal. The question is, are you aware of what’s changing within in you from moment to moment, from season to season, from sunrise to sunset, from breakfast to dinner? Not sure where to start paying attention? Well, from an Ayurvedic standpoint, it’s helpful to know your Prakriti, (your Ayurvedic constitution) to prevent the typical diseases that accompany your constitution based on the five elements – ether, air, fire, water, and earth. Knowing which elements your tendencies and cravings come from can help you prevent behaviors or habits from moving forward that decrease your sense of well-being. If you are interested in learning more about your Prakriti, Vikruti, and treating your doshas, I highly recommend seeking the counsel of a local Ayurvedic practitioner. Within the art of Ayurveda, there will never be one remedy or one sequence that brings everyone or their dosha back into alignment. The response to every inquiry about your health is that “It depends,” as my teacher, Dr. Robert Svoboda, was so fond of saying. “It depends” teaches you to see the interconnectedness between you and your lifestyle, how changing one facet of your routine will affect another. It’s a friendly reminder that humans in general are complex, and it’s wise to look at or diagnose the body/mind/soul from many angles. For me, the spring season brings up a lot of desire for change, to grow food, eat lighter, and to exercise more than during the winter. In general, Ayurveda cautions you from living without enough variety and with too much structure or routine--a “mono-life” as they say. With all the additional sunshine, consider taking some time to be creative and plan new routines rather living out of habit because it’s easy. So now that it is officially spring, I want to encourage each and every one of you reading this to shake up your habits and daily routines or rituals and dream up the most amazing life you can live! 1. Drink hot lemon water with a little salt in the morning to stimulate elimination. 2. Meditate for 5 to 30 minutes on melting glaciers, the image of vibrant green plant life, or new intentions. 3. Exercise outdoors or do a vigorous yoga practice to break a sweat every day, with no exception. In addition to physical workouts, a steam sauna or hot tub can help release toxins. 4. Try an elimination diet for two weeks. 5. 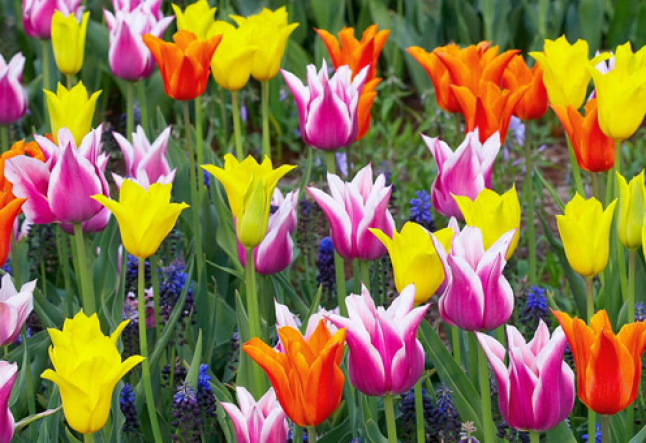 With “spring fever” in the air, it’s a great time to start new projects, take classes, plant seeds, and travel, while the energy is there for the taking. 6. Practice inversions to turn your world and organs upside down. Think of your body like a jug of orange juice. If it sits in one position—upright—for too long, the pulp ends up settling to the bottom of the container. The yogis believe the same thing happens in our bodies, particularly in the organs. The pulp in this case is undigested, inorganic matter that we ingest through the air we breathe or food we eat. By flipping your body upside down, you create a gentle cleanse, where toxins or waste products get pulled by gravity from deep inside your tissues towards the center of the body. With sufficient hydration and exercise, these toxins can move out through the skin (via perspiration), exhaled breaths, urination, and bowel movements. 7. In general, spring is the time to decrease heavy, oily, cold, fat-rich foods such as meat, seafood, poultry, dairy products, and foods cooked in oil. Increase your intake of foods that are bitter (like arugula), spicy (like radish), and astringent (like grapefruit) to promote cleansing of the liver, digestive organs, and blood.